BOA Editions characterizes the poetry of Dariusz Sośnicki by its ability to "open our eyes to the sublime just beneath the surface of the mundane." The Polish writer's poetic inventory includes a train that takes children away from their parents for summer vacation and turns into a ravenous monster; a meal at a Chinese restaurant that inspires a surreal journey through the zodiac; and a malfunctioning printer that reminds of the ghosts that haunt us no matter where we find ourselves. 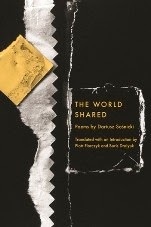 The World Shared, the bilingual edition translated by Piotr Florczyk and Boris Dralyuk in which the three poems below appear, forthcoming from BOA in June 2014, is a dream-catalogue of surrealist riffs and humble strangeness. "Earthly Delights" previously appeared in New Orleans Review, "Monster" previously appeared in The New Yorker, and "A Mouse in a Bucket" appears here for the first time.